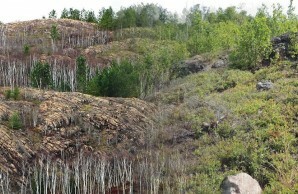 Composite photograph of birch and conifers on a typical hillside with exposed rock in the birch transition zone in the early spring (left) compared with (right) birch and lowbush blueberry, creeping up the blackened rock, in July. Sudbury, Ontario and its surrounds have been hard-hit in the past 1.8 billion years. New evidence suggests that the first blow was by a comet—not an asteroid, as previously thought—that created the second-largest impact crater in the world, known as the Sudbury Basin. 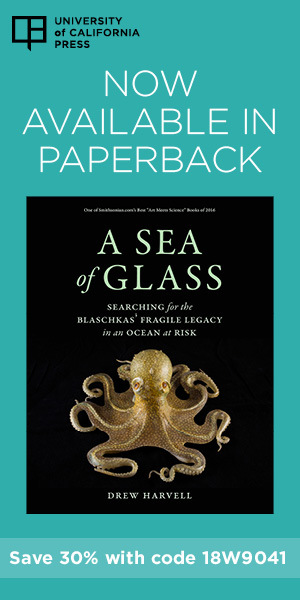 For 700,000 years, the region experienced periods of dramatic climate change, which included a series of ice ages, each lasting about 100,000 years. The last was the Wisconsin Glaciation. The Sudbury Basin was left with huge deposits of nickel, copper, and other metals from the comet and with thousands of lakes from the glaciers. Approximately 12 percent of the 3,637 square-kilometer area of the City of Greater Sudbury alone is occupied by 330 lakes. About 20,000 years ago, the Laurentide Ice Sheet, which had covered much of what is now Canada and the northern United States, began to retreat. 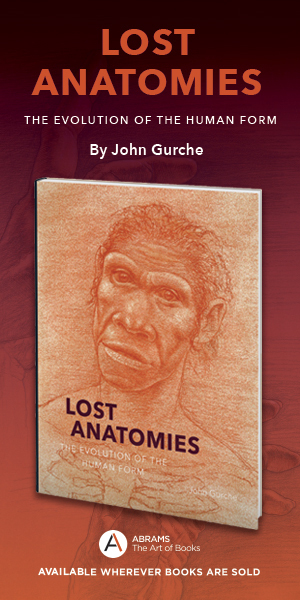 By 10,000 years ago, some of the species that had been pushed south by the ice sheet began to return. Conifers, which can take root even on bare rock, were among the first. They moved into the lands around the Great Lakes and into Ontario and Quebec. The resins in the needles of conifers cause the soil below the trees to become acidic—as is the case in today’s North American boreal forests. Only certain other species of plants can tolerate these acidic conditions. The lowbush blueberry, Vaccinium angustifolium, is one of them. As it thrived in this reclaimed land, early peoples moving into the region (the glacier did not recede from the James Bay area until about 7,000 years ago) would have, no doubt, made this sweet, nutritious berry an important part of their diet. Based on studies of organisms preserved in the sediment of lakes in the area, it appears human impact on the Sudbury Basin was benign until the late nineteenth century. In 1883, however, the copper and nickel deposits— that had remained buried for 1.8 billion years—were discovered when the Canadian Pacific Railroad was blasting rock cuts to build a railway across Canada to British Columbia. The railroad also opened the area to logging of white and red pine, much of which was used to rebuild Chicago after the fire of 1871. The intense logging and aggressive mining that followed transformed the landscape and profoundly changed the chemical and biological composition of the area’s glacial lakes. Logging and mining had the biggest impact, but smaller industries, such as sawmills and creosote plants, contributed to the problem. 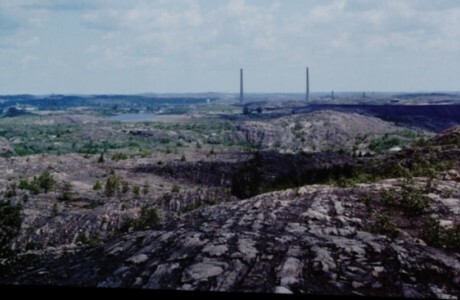 Industrial barrens near the Coniston smelter east of the city of Greater Sudbury; one of the three smelters, once operating in the region, was closed in 1972. The techniques first used to extract sulphur from the ores in Sudbury had been outlawed in England nearly twenty years earlier [see “Rio Tinto and the Mines” Natural History 4/17]. Tons of ore were placed on large piles of logs and the logs set ablaze. From these roast heaps, or roast beds, sulphur dioxide fumes spread across the land and the resulting sulphuric acid killed vegetation. Soils, contaminated with heavy metals, washed off the hills. Bared of soil, the sulphuric acid burned into the surface of the rocks and blackened them. At one point, there were about 42 roast beds operating near Sudbury. Three smelters were eventually built, each with tall chimneys, the tallest being a “superstack” at 137 meters. The most severe damage occurred near these three smelters, resulting in industrial barrens, totaling about 170 square kilometers, where no plants could grow because of acidity and particulate heavy metals. Adjoining these barrens was a semi-barren zone of about 720 square kilometers, known as the birch transition zone, where acidity and heavy metals were less destructive. Here, soil existed that could support tree growth, white birch the most pollution-resistant and dominant species. White birch is well known for its ability to grow in harsh environments, such as the far north near the tree line. The white birches near Sudbury, however, are stunted and grow in a coppiced manner. 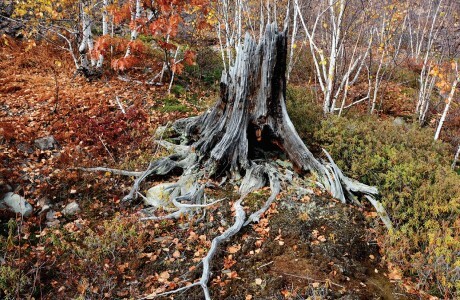 They have numerous shoots that keep arising from stumps that have remained alive long after the trees were cut down by early miners and smelter workers. They grow more like shrubs than trees. And growing beneath these forests of stunted birch are dense patches, or clones, of lowbush blueberry. Thick mats of lowbush blueberries, with their intertwined stems, accumulate birch leaves in the fall, which helps protect the ground from drying out and over-heating. The first birch seedlings have a precarious existence because the habitat with its sparse vegetation tends to frost heave in late fall, which often pushes the seedlings out of the ground and breaks them apart. If they survive frost heaving, birch must tolerate abnormally high temperatures on the black rock surface, which sometimes reaches the lethal temperature of 60ºC. But once a few birches survive and start producing leaves and leaf litter, blueberry seedlings can establish and, over time, grow in thick mats. A thick leaf litter helps to retain moisture from snow and rains in following years to the benefit of both species. 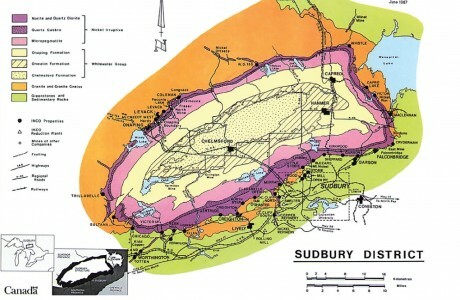 Map of Sudbury Basin includes the impact zone of a probable comet, a ring of copper and nickel mines around the crater, and the city of Greater Sudbury (lower right). 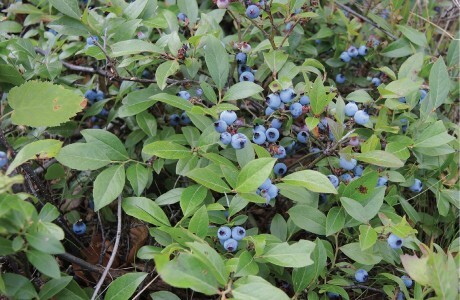 Since the 1970s, when pollutants from the three smelters were being reduced by government order (one smelter was closed) and by technological advancements in pollution abatement, blueberries began to spread to the industrial barrens and to the tops of rocky hills, which had been barren even in the birch transition zone. 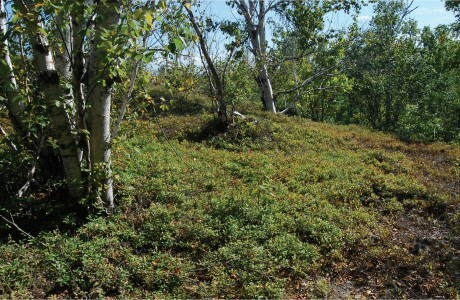 Acid-tolerant lichens and mosses had started colonizing the industrial barrens and hill tops in the 1980s, which provided substrate for blueberries and birch. 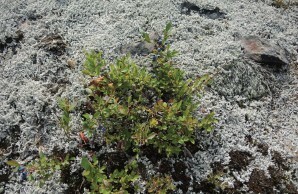 Blueberries were one of the first plants following lichens and mosses to colonize smelter-damaged hillsides. At the same time, researchers at Laurentian University in Greater Sudbury developed an effective combination of crushed limestone and fertilizer and began applying it, along with seeds of acid-tolerant grasses, to the barrens and damaged hill tops. Grass started growing on the bare rock within a year. A year after that, birch seeds, which may have been blown by the wind or carried on the surface of snow, began to germinate, followed by lowbush blueberry plants from seeds perhaps deposited by birds and mammals. Summer students at Laurentian University and employees of the two mining companies that operate in the area soon became involved. They covered hundreds of hectares of industrial barrens with limestone and fertilizer. Thousands of red pine and jack pine seedlings were planted on the barrens and on denuded hilltops in the birch transitions zone, coordinated by a community group called the Vegetation Enhancement Technical Advisory Committee (VETAC). The rebuilding of Sudbury’s forests had begun. Research at Laurentian University has shown that metals do not accumulate within the fruit of blueberry plants even though leaves, stems, and roots of the Sudbury shrubs may have elevated levels. For ecologists, the recovery of this polluted environment provided the opportunity to observe a unique, human-influenced form of primary succession. Monitoring the lowbush blueberry in Sudbury’s human-altered environment has also provided me an opportunity to study their life history strategies. Thick carpet of lowbush blueberry growing beneath coppiced white birch. Lowbush blueberry is a member of the heath family. It is a low spreading deciduous, perennial shrub averaging 30 centimeters in height. The leaves are glossy bluegreen in the summer, then turn red to purple in the fall. Flowers are white, bell-shaped, and about eight millimeters long. Berries are dark blue and are covered with a white powdery material called bloom. Lowbush blueberry is native to North America, and in Canada it is found from Newfoundland and Labrador to Lake Winnipeg and north to a latitude of 57º. It is a member of many natural plant communities on outcroppings of the Canadian Shield, but grows best in light, well-drained, acidic (pH 4-5) soils. Vaccinium angustifolium is one of three species found in eastern North America that is harvested for food. A less common species found in the Sudbury area is Vaccinium myrtiloides, which is distinguished by fuzzy leaves and stems compared to the smooth surface of V. angustifolium. 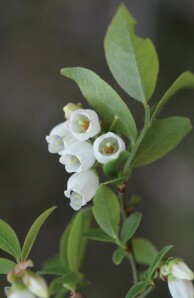 A third species, the northern highbush blueberry, Vaccinium corymbosum, found in southern Ontario, is 1-3 meters tall and has been transplanted to farms elsewhere in North and Central America, where it is grown in orchards similar to apple trees. Berries from highbush are usually the ones found in grocery stores. Lowbush blueberries have been a food staple in eastern North America for centuries, with indigenous peoples and settlers maintaining small patches by burning the patches every three to four years. Today, larger fields are maintained in much the same way by commercial growers. The fruit is harvested on a two– or three-year rotation, following either mowing or burning of the shrubs to stimulate the formation of adventitious shoots and a dense blueberry crop. Because lowbush blueberries can’t be planted or farmed the way other industrial crops can, they are the only ones marketed as “wild” blueberries. They are known for their nutritious value because of their high level of antioxidants. Stump of a large white pine, with stunted “bonsai birch” nearby. About 30 centimeters of soil has been washed away from the roots of the stump. As an entomologist, I approach the study of lowbush blueberries and their attributes by comparing them to insects. Shrubs evolved as sessile organisms whereas insects evolved as mobile organisms. Being literally rooted to the ground, shrubs must be able to withstand and adapt to constantly changing weather and encroaching neighbors, and to develop a passive resistance to predators. Their bodies are composed of hundreds of distinct interconnected modules, with each module capable of surviving on its own. The key functions of shrubs are not restricted to one area of their structure. If they were, their removal by herbivores would jeopardize survival of the entire organism. Not having a central nervous system or a brain is another difference between shrubs and insects. However, all parts of a shrub are connected and information is constantly exchanged among leaves, roots, flowers, and stems. Shrubs have an extensive sense of their immediate environment and react to light, temperature, water, nutrients, touch, soil structure, toxins, microbes, gravity, insect attack, and chemical signs from other plants. The most sophisticated part of shrubs is likely the roots. Roots do not flounder randomly as they grow downward, but search for the best position to take in water, avoid competition, and garner chemicals. In addition, a blueberry seed germinating underground with no light can sense gravity at the tips of its roots and tell the rest of the plant which direction is optimal for its growth—shoots need to grow up and roots to grow down. The advantage of this evolutionary development is that shrubs can survive even after losing 90 percent or more of their biomass. Blueberry shrub established on a mat of acid-resistant lichen growing in once industrial barrens. Most blueberry shrubs are resistant to attack by leaf-eating insects, but sometimes their resistance is breached. For example, the outbreaks of forest tent caterpillars in 1989 and gypsy moths in 1994 were so severe that after the caterpillars had eaten all the birch and oak leaves, they completely defoliated all the blueberry shrubs throughout the Sudbury region. In both cases, however, the blueberry shrubs survived unscathed. During the onslaught, they likely moved water and sugars from their leaves to their underground parts and had enough reserves that leaves, flowers and fruit returned to normal the following spring. In 2015, early spring was also normal and a good crop of flowers appeared, but then came a few days of frost in May. Many of the flowers were damaged. However, flowers that survived the frost in more protected sites, and those that appeared a few days later, were not damaged. These flowers were successfully pollinated by insects and turned into small green berries. Immature berries were developing normally, and then there was a prolonged period of below-average precipitation. The thin layer of soil on Sudbury hills dried out and, as the shrubs experienced drought, they reacted by simultaneously dropping their fruit. The response not only occurred in areas of dry soil, fully exposed to the sun, but it also occurred in shaded areas with adequate moisture. It was as if a message was sent out by the most stressed plants to warn others of a pending drought, and they reacted collectively. One possible chemical messenger might have been ethylene, which could have been released by plants suffering the most severe effects of the drought. Ethylene is a known regulator of responses to environmental stresses and is produced naturally throughout the life cycle of all plants. It initiates leaf senescence, the aging process that produces autumn foliage, and is produced in copious amounts in ripening fruit. Perhaps ethylene was the signal used by blueberry shrubs in the Sudbury area instructing ramets to drop their fruit. A week later the leaves shriveled and dried, becoming so brittle they crunched beneath my shoes. It was as if a signal emitted and received over the entire region raised the alarm that damaging drought was eminent and water and food resources must be pulled into the rhizomes and roots for use later when conditions improved. The shrubs remained this way until late September when it rained. Once moisture levels returned, the shrubs moved water back into the stems and sprouted new leaves, which produced food and contributed to the overall resources of the clone. Lowbush blueberry shrub with a crop of berries. This nutritious fruit has likely been harvested in the Sudbury region for over 8,000 years by various human inhabitants. These observations show how intimately blueberry shrubs are attuned to weather conditions. Late frosts frequently occur, but some of the flowers always survive. If all flowers are damaged, or if it is too cold for pollinators to do their work, the shrubs simply put off their attempts to reproduce by seed until the following year and instead put their resources into expanding the clone. So, it appears the lost 2015 crop was a combination of two factors. The frosts in mid-May reduced the number of flowers, and drought in July caused the plants to drop their berries. Fortunately for longlived shrubs such as lowbush blueberries, the loss of berries in one year is non-consequential. However, if the trend continues, it could become a serious problem for the shrubs. There is the worrisome possibility that the 2015 drought, along with a lower-than-average crop in 2016 was a local indicator of global climatic change. Other local indications of global climatic change were the high temperatures and lack of precipitation (snow) experienced in the fall of 2015. The ability of lowbush blueberry shrubs to thrive in harsh habitats, including smelter-polluted, industrially damaged hillsides, and to overcome frequent periods of adversity such as widespread defoliation, attests to how accomplished they are at adapting. Their contribution to the greening of the Sudbury Basin, however, may have made the area more vulnerable to yet another assault. In the relatively short time that industrial pollution has been abated, acidity in Sudbury’s glacial lakes has been reduced, making them desirable for residential development, which can produce a new set of stresses on the environment—increased population and sewage, less pervious surface, increased runoff, erosion, and loss of habitat diversity, to name a few.